doing a BEE based on the scrappy making fabric concept. Each month we will be posting our idea blocks and the blocks made for each person. My INSPIRATION block was from a portion of my grandmother's quilts. IMAGE Above.. 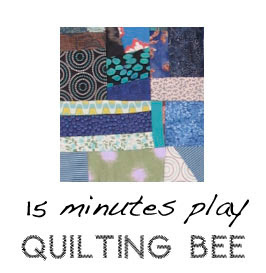 Her crazy quilts used many different shape, and many long strings bits. 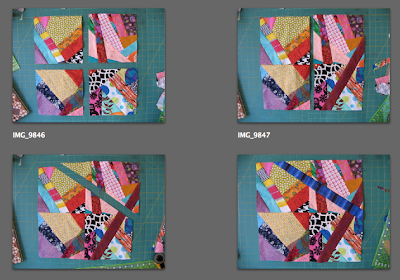 I wanted to see what will happen if I made a Scrappy block and kept cutting into it to add LONG strip bits at yet another angle to the block I have already made... I am going to tell you what I did on my block, But I do not want you to make your block the same size... 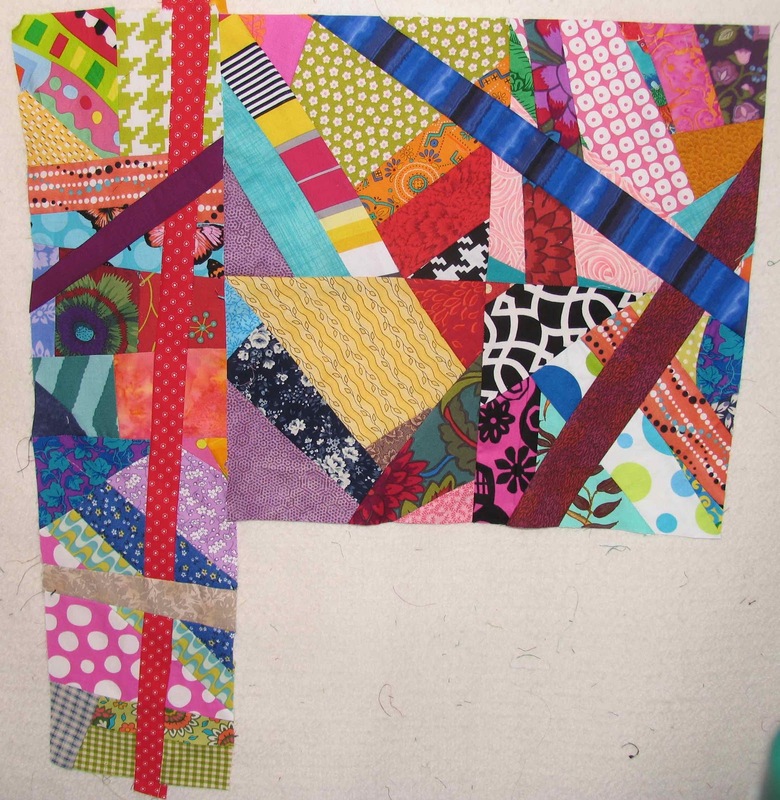 I am looking for all different size blocks... ANY SIZE SQUARE, RECTANGLE OR STRIP, Make the fabric ( ANY COLORS, prefer BRIGHT and contrasty) either all in one piece or piece together a few block like I did below, Then as you assemble cut into it again to add at least TWO strips that cut through the block... Here's what I did. 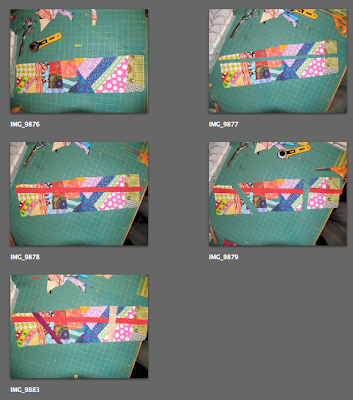 I spliced them and added a strip that runs through the whole thing. through at another angle another long strip. Send me an email with any questions... there is no right or wrong way to make this. Okie dokie! Looks like fun! This looks beautiful! I already started the block and enjoying the process. My brain is too tired to understand a thing you said, lol. I like it though and will have to reread it tomorrow, but I do love crazy quilting. I worked more on the block last night. I wasn't a big fan of crazy quilts until I saw your grandmothers pillow and made a block. I can't wait to make another and another! I see how this can be totally addicting! OK, I get this concept. But in the Bee are you exchanging blocks, just sending some to you? or .. can you take a second and explain it to me? How do I join, if it's not too late? Wow, V! I'm way behind in checking up to see what's going on over here, but seriously? OMG, so many cool things! I would be so happy to be half as creative as you. Thanks so much for sharing your gift! OMG I *need* to give this a try!! This really is the coolest idea. You could really do this with any block!! Thanks for sharing.